This week the weather forcaseters imagined a big storm hiting the Northeast; however, it only brought a few inches of snow. The windblown snow that did arrive stuck to everything. The first image is from the side yard, before the turkeys got to tranpling through the snow. I also drove to some locations in town where streams pass under the road to see if I could find any good scenes to photograph. Then I went into the back yard to photograph the birds coming to our feeding stations. The scenic images were taken with my new Canon 5D Mark II and a 24-105mm IS lens. The the birds were photographed with my Canon 7D, and the 500mm f4 with a 1.4X converter on it. I cropped the images after that. It’s amazing how small a crop can be made and retain the details of the feathers. I had the opportunity to be in Kauai while on a job and managed to get out and photogrpah on the weekend of June 13-14. Although I’ve been to Kauai many times over the last 30 years, this is the first time I’d seen large waves on the south shore. There was a large storm off to the north that resulted in many waves coming in from different angles. 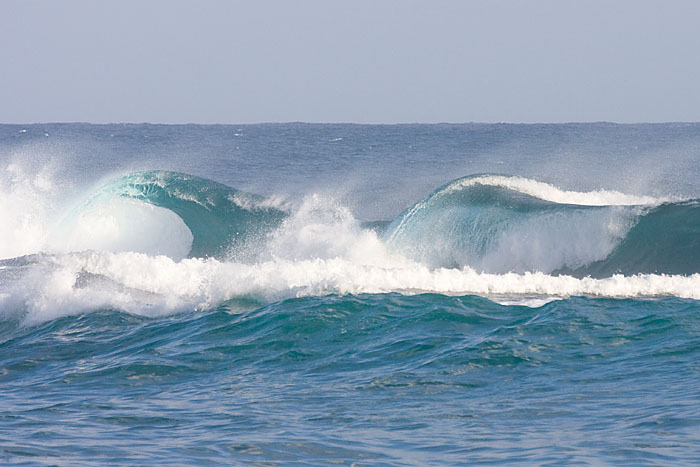 At some coves it looked like a washing machine as waves came in from different angles, sometimes combining intoa great froth of water. The karri tree grows only in South West Australia and is one of the tallest trees in the world. A hardwood tree growing to 90 meters in height, it sheds its grayish bark each fall leaving a pile of shredded bark at its base, revealing smooth new bark in patches of white, yellow, and orange. The trunk extends straight up and has branches only near the top. Several of these tress have been put into service as fire towers by building platforms near the top made accessible by ladders attached to the trunk. Several trees have also had these ladders intalled to permit access by the public. As there is only one ladder on the trunk, people decending must pass those accending the tree. Not for me. These images are from Gloucester National Park, Beedelup National Park, and Warren National Park near Pemberton, West Australia. Many caves are located in the Cape K=Leeuin Naturaliste National Park. While three of these caves are electrically lit, two with guided tours and one self-guided, there are othes which are explored wearing a hard hat and headlamp. I did not explore these, but I did venture into Mammouth Cave and Lake Cave. Mammouth is self guided, so there is as much time as you need for photography; however, tripods are not allowed. This made photography difficult but possible using the railing in corners where the camera could be suppported. This limited the selection of subjects to those near the corners of platforms. In Lake Cave it was more difficult, as I was part of a large group. The only useable images were made with the camera placed on teh edge of the platform. The caves are quite beautiful, lit as they are with yellow and redish lights. Using flash revealed the true color to be more whitish or grey, what would be expected for limestone. Thin tubes are formed as mineral laden water drips through a tube, adding material to the end of the tube. In Lake Cave, the main feature is actually suspended above the surface of the water. The base was originally attached to the bottom of the cave lake, which was disolved over time and lowered. Nambung National Park is a three hour drive along the coast 245 km north of Perth. 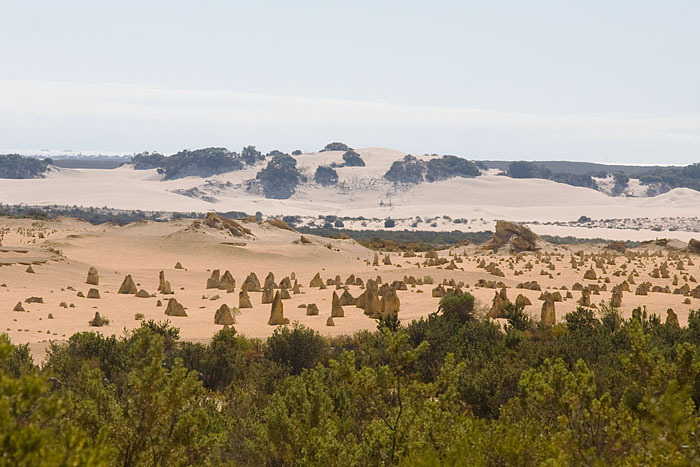 Within the park is the Pinnacles Desert, an area of yellow sands and limestone outcroppings. Thousands of stone pillars stud the area, some up to 12 feet high. Starting as a area of sand dunes blown inland from the beach, rain water leached lime from the sand near the surface and concentrated in lower levels of the dune, cementing the sand together into limestone. The pillars were a result of a hard crust of calcrete that formed over the top of the limestone. Water seeped through cracks in the crust and further dissolved the limestone leaving columns of harder limestone under calcrete caps. Winds blowing the sand away exposed the columns we see today. I arrived at the Pinnacles at mid-day, making photography difficult, although the day was clear, with little breeze. For many years, Jean Keane fed fish to eagles in Homer, Alaska during the winter months. The town established an ordinance prohibiting the feeding under the belief that doing so was detrimental to the well being of the eagles. While there is much controversy over this decision, 2009 is to be the last year that the Bald Eagles will be fed during the winter months in Homer Alaska. I decided to make the trip and try my luck at photographing eagles in flight. The road from Anchorage to Homer passes along Turnagain Arm, a large expanse of water which is very shallow due to the silt build up from glacial waters. The huge tidal difference is evident in the chunks of ice that form when high tide brings in a lot of water, and then flows out at low tide leaving the ice sitting on the bottom. Further along the road to Homer are several rivers. The rivers keep flowing, with the amount of ice on the surface varying with the flow of water.